I haven’t posted here since May 2013. Why? It wasn’t because of a job change – I’m still at Aviat Networks. Something happened in June 2013: one of my closest, dearest friends received a terminal cancer diagnosis. Why am I mentioning this on a blog about my life as a professional? Because it did impact that, in several ways. Learning that my friend was going to die began a time of stress, sadness, and reallocating my personal resources. While I was honored to be on her care team, maintaining a work-life balance took a lot more energy. Blog posts weren’t as important! I didn’t socialize as much. Work was actually something of a refuge. I didn’t tell many people at work, but when I did, I was touched and impressed. One colleague, who is also a friend, helpfully shared her own experience of a close friend dying of cancer. And then there was what happened the day after my friend died. At my desk, my mobile rang. Brief calls usually aren’t a problem, so I took it. Suddenly the phone blared into a speaker-phoned video call. “Hello? I’m so sorry, I can’t turn the video call off! I don’t know why it’s doing this! We met at the hospice. I’m calling her friends on her phone to let them know she passed away last night! I know you were really close and I wanted to let you know and to say how sorry I am. Can you please not post it on social media until the family…” Shattered and blushing, I did my best to bring the call to a quick conclusion. My two nearby co-workers couldn’t help but overhear. They were utterly gracious about this intrusion and gave their condolences. They also did not pry. I hope that, a few hollow-eyed days aside, I was as professional yet kind as they were. 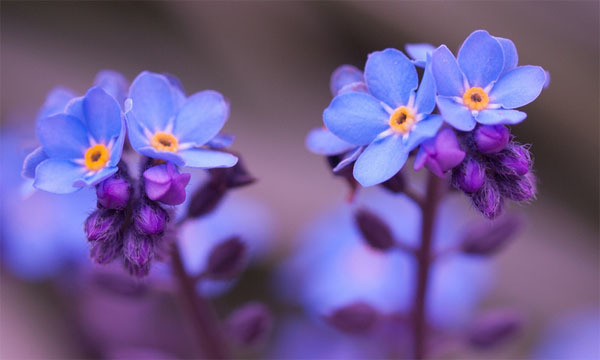 thanks to photographer William Warby for his forget-me-not flower image, reused courtesy of Creative Commons.